My iPad plays many roles in my house. We use it to stream movies and TV shows, to read magazines and books, play games, make notes, send emails, etc. We all use it – even my two-year-old! I have quite a few different covers for it and switch them depending on the need, and who’s using it. With my husband using it more for his business needs, I’m glad to have a nice new, professional looking folio for him to use from Levenger. 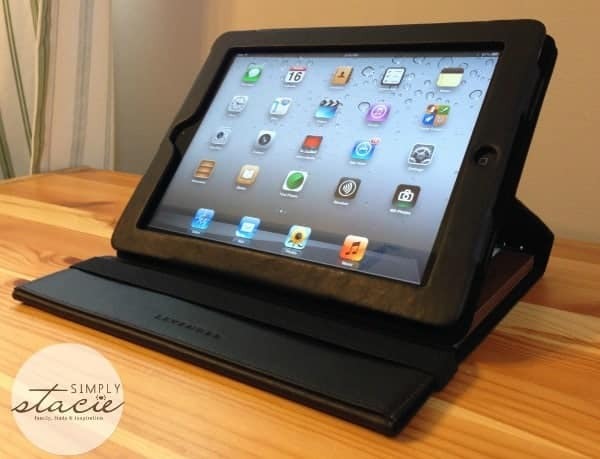 We received a Work and Play iPad Folio in black for review. It arrived wrapped in a soft cloth, inside a beautiful box – making it great for easy gift-giving. 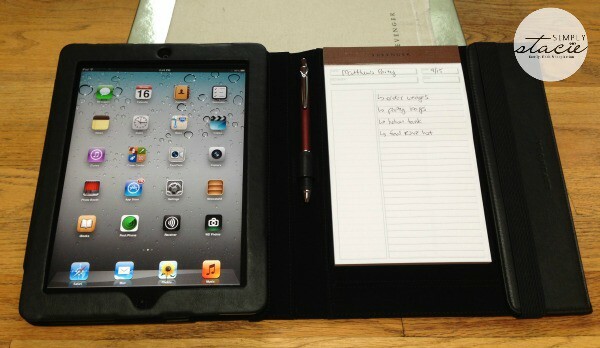 This folio features a built-in note pad, a pen holder, and slots for business cards. My iPad slid nicely into the holder, and I felt like it was well protected. What I like is that the iPad sleeve is held in the folio by strong magnets, making it easy to pop out my iPad to take a picture or use on its own away from the the notepad section. It’s also easy to set up and angle to watch videos, read a recipe, or stream a movie. I like the notepad piece of this because it’s not always practical to type notes in every situation – especially if you’re brainstorming or just need to jot down a few quick thoughts. As much as my husband and I are addicted to technology, there are times when you can’t beat a plain old pen and paper! When it’s not in use, there’s a strong elastic strap that keeps the folio shut tight, keeping its contents protected. I think this folio is ideal for traveling on business or using in the classroom. This will certainly come in handy for my husband when he has to travel next month for a business conference. He’ll be able to use the iPad, take notes, and collect business cards from colleagues, all while being able to keep everything in one place. It has a very professional look, and you can see and feel the quality of the materials used to make this product. 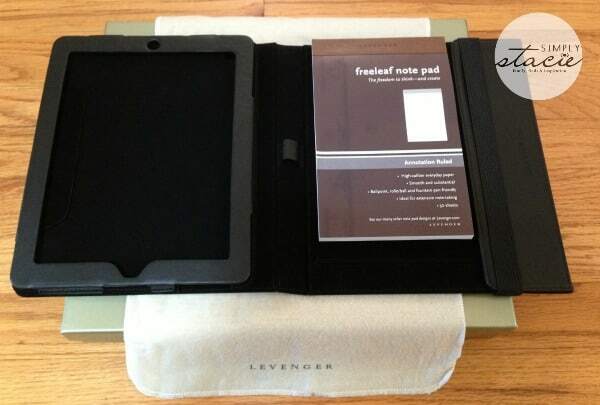 Usually $149, this folio is now $119 on the Levenger site. Around since 1987, Levenger is committed to providing customers with quality products that are thoughtfully designed, responsive to current needs, and respectful of the environment. They feel their purpose as a company is to inspire productivity and to enrich customer’s experiences as readers, writers and thinkers, and they are dedicated to being a premier source of products and ideas that help people in both their personal and professional life. To see the full line of quality products Levenger has to offer, visit their website. You can also find them on Facebook, Twitter, Pinterest, YouTube, Google+, and their blog. I have had my ipad cover for a year, unfortunately my son has gone through 2 in the same time. This looks like a good cover for me, but would it stand up any better for him? Thank you for the review. Wow, this is an awesome case!! I need something like this with paper, that’s so handy! Nice, secure fit is great. We all use the iPad so it gets moved around a lot. You want a case that is easy to handle and durable to last through several people’s using. The stand and place to put your pen or stylus both would come in handy. I have yet to buy an Ipad. Would be nice to be able to afford it. For now all I do is enter contests to try win one.